For over 25 years, Dr. David Lee has helped thousands of patients restore their feet using his advanced podiatric surgical techniques. He completed his Podiatric Surgical Residency training in Reconstructive Pediatric Foot and Ankle Surgery in 1993 and began his private practice in Costa Mesa & Newport Beach, California. In 2005, he relocated to Arizona and re-established his practice and was appointed as Adjunct Professor at Midwestern University, School of Podiatry. Highly respected and noted for his expertise in complex foot and ankle conditions by his peers, patients from across the U.S. and Europe travel to undergo Cosmetic Bunion Surgery using Dr. Lee's innovative "no visible scar" technique, Brachymetatarsia Restorative Surgery and Restorative Surgery for Failed Foot Surgery. Known as the "doctor's doctor", podiatric surgeons often seek Dr. Lee's advice and expertise on treating their own patient's complex foot conditions. He regularly volunteers (since 2005) as a surgeon for The Flying Doctors of Mercy- LIGA where he travels to San Blas, Mexico to surgically restore the children afflicted with clubfeet and other severe foot and ankle disorders. 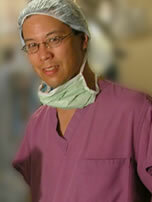 Dr. Lee is internationally known for his innovative techniques for Brachymetatarsia treatments. Dr. Lee has successfully completed over 350 cases of this very rare condition. As well, he has been featured in news articles by the Orange County Register, Fox/UPN's News and cable television's The Wellness Hour (hosted by Randy Alvarez) for his work on the topic of Cosmetic Foot Surgery. When you first meet your patient what is your purpose? My purpose is to understand, not just hear. I can't help a person if my knowledge of medicine doesn't relate to their personal situation physically, emotionally, mentally and spiritually. Most of my patients are surprised because I spend such a long amount of time with them during their visits. In the busy world of medicine it doesn't make economic sense. But truthfully, how well can you get to know someone in 5 minutes? By investing time with people I can gain a more thorough understanding of their condition and determine a truly effective treatment program. What's important for your patients? Truth. Conversation is the process. Understanding is the goal. Truth stands on the foundation of understanding when I work with people. My patients need to understand what is going on with them so that they can be involved in the decision making process of healing. Through truth and understanding people heal better and have less stress. Why did you choose Podiatry? My parents had a lot to do with the profession that I chose. In my high school years they guided my learning on which professions to search out. I explored dentistry, obstetrics and gynecology, and podiatry. After looking at the books on these subjects podiatry was an easy decision. In the early years of my schooling I wanted to work with athletes, however, as my understanding of surgery grew I knew I had to be a surgeon. My staff is absolutely phenomenal. Just call our office and talk to them and find out for yourself. You'll find that they are the happiest people to work with. They will go out of their way to help my patients as well as me. How do you feel about your patients getting second opinions? I encourage it. Although I try very hard to relate to my patients so they can make good decisions about their care, I know I can't be successful with every patient. If a person feels the need to get better understanding or confirmation of a diagnosis or treatment, they should get a second opinion. Often I make unsolicited recommendations for second opinions to confirm very difficult cases. What is your policy about talking live with patients? Unless I'm with another patient I am always ready to talk to someone. My staff never says, "Dr. Lee's busy seeing patients" unless I really am. What do I do if I have a problem or emergency in the middle of the night or the weekend? Call me immediately. Don't wait until the next morning to call me. If you have a problem at 3 a.m. call me then, not at 7a.m. I actually sleep better knowing that you will call me without hesitation if you have a situation that either is painful or worries you. Don't worry about feeling abandoned on the weekend or in the middle of the night. You always have a direct private line to me.